This post was made in collaboration with Curel®, a KAO Worldwide brand. As many of you know, I’ve been struggling with dry skin and have been searching for the perfect solution to treat it for good. 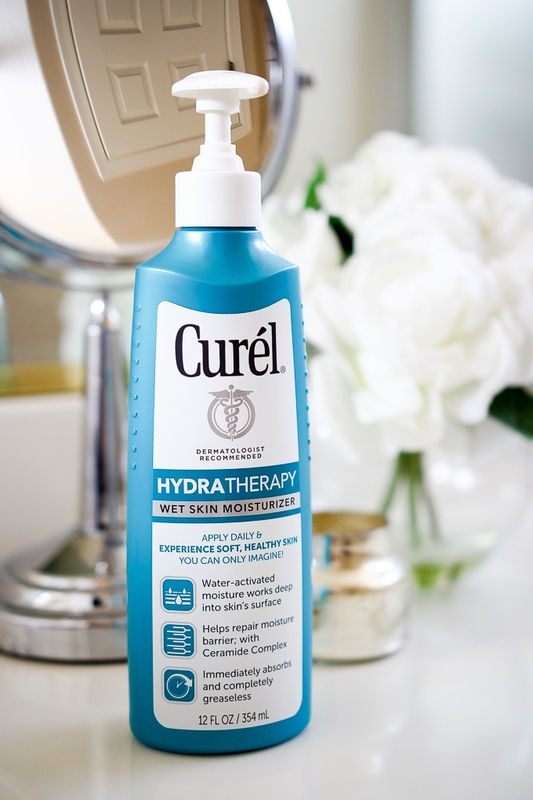 Recently I discovered the new Curel Hydra Therapy Wet Skin Moisturizer and was so excited to use it and see how it would help my skin. Today I am so excited to share with you a quick update and what I learned. It’s been a few weeks since I first started using this moisturizer and can happily say, with daily use, my dry skin is gone! To use it effectively, I made sure to always apply it to my wet skin right after a shower or bath before I toweled off. It glides on the skin so smooth. It’s a thick cream and feels so luxurious on the skin. I could tell right away that it was going to work wonders for my combatting my dry skin. No more, would I look down at my legs or arms and see red, cracked, flaky skin. My skin is so different from when I was younger and finding the new Curel Hydra Therapy Wet Skin Moisturizer has become the perfect solution for treating my uncooperative dry skin. Living in Utah and Arizona where the air is so dry was a main factor in my dry skin. Not to mention stress, hot showers and harsh soaps my skin was in need of some serious tender, love, and care. If you are someone who suffers from dry skin then I’m sure you can relate to how uncomfortable it can be to have dry skin. The worst is when someone else would notice the dry skin around my elbows and knees or my dry, red knuckles. Now I make a daily, conscious effort to take better care of my skin. I am so happy that the solution only takes a few extra minutes every day! In case you haven’t heard of the new, Curel Hydra Therapy Wet Skin Moisturizer, it’s a new wet skin formula that lays the foundation for better moisturizer. 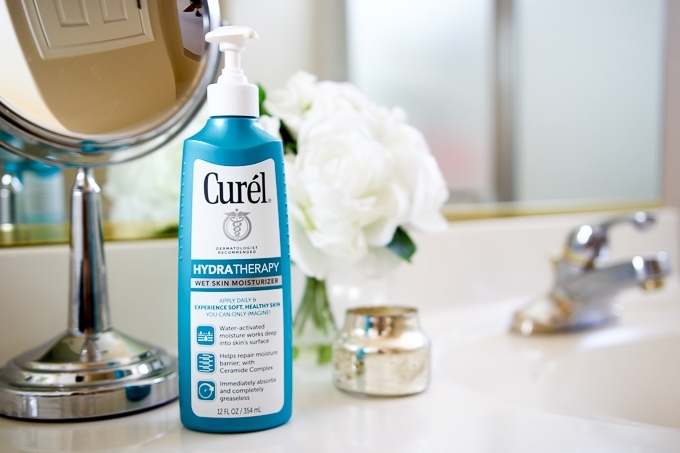 After a bath or shower, since your skin cells expand, it provides an easy way for Curel Hydra Therapy Wet Skin Moisturizer to soak in and penetrate into just showered skin before it’s dried off. The skin’s natural moisture barrier is maintained by ceramides which are building blocks necessary for healthy skin. Skin that is dry and damaged have lost their ceramides so it’s important to put them back into the skin. Since Curel Hydra Therapy Wet Skin Moisturizer contains an advanced ceramide complex it can help penetrate the skin to the source of the dryness. This helps replenish the skin’s ceramide levels and repair the moisture barrier. With new ceramides and Hydra Therapy dry skin can be targeted in a unique and effective way. Maintaining my skin, ensuring it stays healthy and hydrated will always be a high priority for me. I could tell after the first use that my skin felt softer and more smooth. I can honestly say that I no longer feel embarrassed or self-conscious of my skin and love how hydrated it feels all day long. I’ve made Curel Hydra Therapy a daily part of my skincare routine and love how healthy my skin looks again! If you’ve tried a ton of different moisturizers and haven’t found one that you love then I highly recommend trying Curel Hydra Therapy. It’s helped me heal my dry skin and I know it’ll work for you too! Visit Curel.com for more product information! Then be sure to follow Curel® on Facebook and Instagram.